Hastings United Football Club has been handed another home draw in the FA Cup this afternoon (Tuesday). Chris Agutter’s side will host Kingstonian in first round qualifying on Saturday September 8 following its 3-2 preliminary round success at home to VCD Athletic at the weekend. 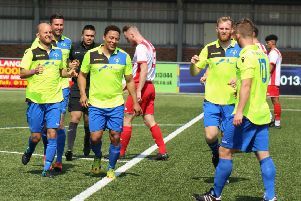 Hastings lie third in the early Bostik League South East Division having won all of their opening three league matches, scoring 11 goals in the process. Kingstonian are 18th in the Premier Division with four points from five games. The two clubs faced each other in a pre-season friendly at The Pilot Field last month, a game which ended in a 1-1 draw. At stake for the winners is £6,000 from the FA’s prize fund.